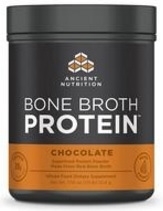 For chocolate lovers, it’s almost too good to be true: Bone Broth Protein Chocolate has a light, milk chocolate flavor with none of the sugary side-effects. Use in smoothies or on its own with almond milk, coconut milk or even water. Other Ingredients: Natural chocolate flavor‚ cocoa powder‚ xanthan gum‚ guar gum‚ stevia extract‚ monk fruit extract. Paleo-Friendly / 100% Natural / Dairy-Free / Soy-Free / Grain-Free / Nut-Free / Gluten-Free.